Once in a blue moon a player comes along who I feel compelled to go and watch live, stalking them from the sideline, tracking their behaviour and movements over the length of the contest. Modern technology provides an experience that is arguably superior to being at the ground in terms of close-ups and replays, but there are some athletes who demand to be appreciated firsthand and close-up. The last time I felt this way about a rugby league player was back in 2003 when schoolboy sensation Benji Marshall made his first-grade debut for the Wests Tigers. I have since enjoyed watching Benji weave his magic many times at Leichhardt and Leumeah. Maybe it’s the coach in me, but I wanted to understand what it was that made him stand above others. What was his demeanour like, how did he communicate with teammates and could I see a fraction of what he saw on-field before that moment he seized an opportunity? Sixteen years later I have another irresistible reason to get out to a game. 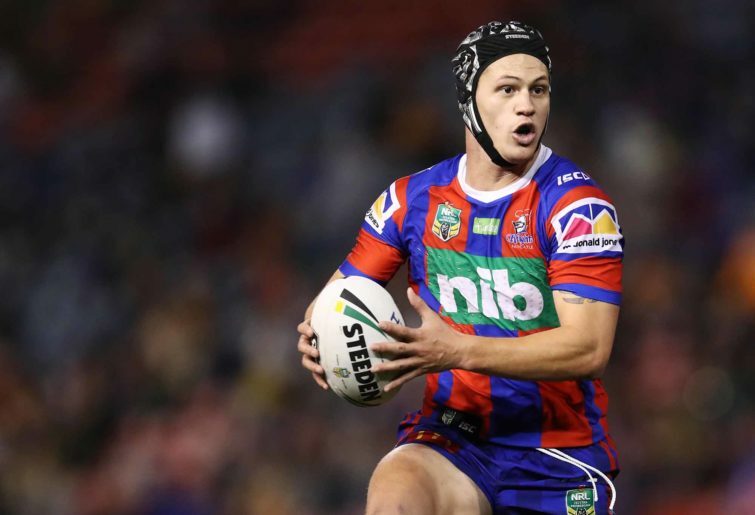 Kalyn Ponga is the latest athlete that has me champing at the bit to sit on a plastic seat with a beer and a pie. I have been living on the other side of the world since Kalyn burst on to the scene, so I have been restricted to watching him through the app devised for overseas viewers. Getting to McDonald Jones Stadium has proved difficult. The 2018 Newcastle player of the year has the speed, anticipation and wicked sidestep that had fans gasping in Marshall’s early years. Last season, playing mostly as a fullback, Ponga showed that he has great vision. He is as comfortable putting tries on for teammates as he is scoring himself. In 2018 he topped the Knights for line break assists (13) and was second to Mitchell Pearce for try assists (11). At the same time he ranked third in the NRL for tackle breaks (140). I am going to go out on a sturdy limb here and say that barring serious injury in 2019 Ponga will lead the Knights to their first finals appearance in six years, star for Queensland in State of Origin, win Dally M player of the year and establish himself as a future Kangaroos great. Fans have been saying it’s only a matter of time before Ponga becomes an established star at the highest level, so these statements aren’t exactly bold. What I am saying is that after playing only 29 NRL games his time is right here and right now. The 20-year-old will shift to the halves for the Knights this season. I wouldn’t be surprised if the same move occurs at the state and national-team level. The gaps left by the retirements of Cooper Cronk and Johnathan Thurston have not been filled for the long term despite claims of quality players such as Daly Cherry-Evans, Cameron Munster, Mike Morgan, James Maloney, Ben Hunt and Luke Keary. The best playmakers in the NRL need to have the ball in their hands most often. Ponga fits in that ‘best’ category. There is nothing more daunting for an opposition defence than a player who has the capability to find space for a teammate or can slice through a gap himself. Darren Lockyer, who also switched from fullback to the halves, albeit later in his career, is another player who springs to mind. Ponga will shoulder an increased defensive workload this season as opposition teams send heavy traffic his way. His brief introduction to the toughest arena, State of Origin, last year convinced me that he has what it takes to operate on the front line at the highest level. 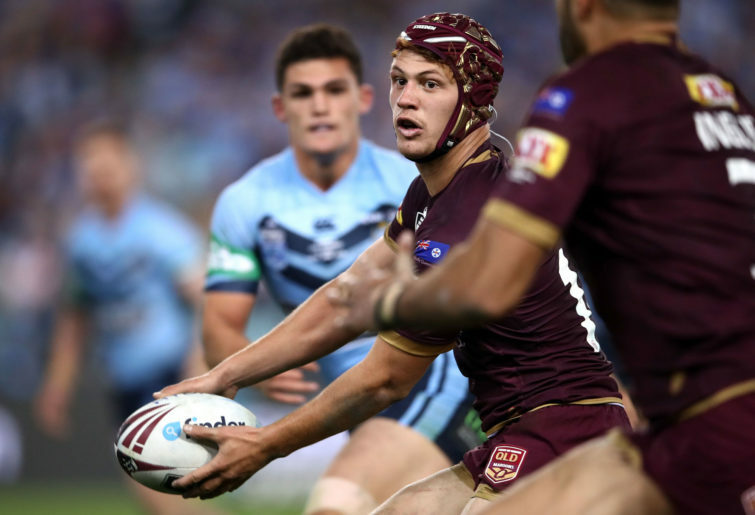 At the 28th minute Queensland State of Origin coach Kevin Walters threw Ponga into the battle as a middle forward in Game 2 with the series on the line. Not only did he come up with 29 tackles, but he also went within a whisker of taking the series to a third-game decider after breaking the line in the 68th minute and being pulled down by Tedesco in a last-ditch tackle. The key to Ponga’s seamless transitions to higher levels and a new position may just be his naturally calm demeanour. A regular guest on television rugby league chat shows in 2018, he showed no sign of nerves. It was as if he was sitting on his own lounge having a casual chat. His mum Adine once said he is so relaxed that sometimes she wanted to strangle him. The rugby league community went into meltdown last year when during an interview with TVNZ Ponga apparently revealed a desire to be an All Black in the future. All Blacks coach Steve Hansen added fuel to the fire by saying how much he admired him as a player and would definitely be interested. This from a man who has some quality rugby talent at his disposal. Ponga has since hosed it all down and said he was taken out of context and he is committed to rugby league. He is an athlete who will always be chased. A champion junior golfer, he had AFL, rugby union and soccer knocking on his door as a youth. At present he is a rugby league player, and a mighty talented one at that. With the international game growing and expanding he would be my nomination for a global rugby league ambassador. Kalyn will line up in the five-eighth position for the New Zealand Maori against the Australian Indigenous side this Friday night in his first hit-out of the season. Strap yourselves in for the season of Ponga, league fans. It’s going to be a thrilling ride.